RAVENOL USVO® High Fuel Economy HFE SAE 5W-16 is a PAO (Polyalphaolefin) based, fully synthetic low friction motor oil with especially USVO® and proven CleanSynto® technologies for passenger car petrol engines with and without turbo-charging and direct injection. It minimizes friction, wear and fuel consumption. This futuristic lubricant is especially recommended for hybrid cars. It was formulated with tri-nuclear molybdenum and OFM (Organic Friction Modifiers), in order to achieve minimal friction and wear, whilst achieving excellent cold start properties with optimum lubrication reliability in the cold running phase. Extended oil change intervals are possible according to manufacturer’s specifications. RAVENOL HFE SAE 5W-16 helps protect the environment by reducing emissions and you'll notice the drop in fuel consumption. 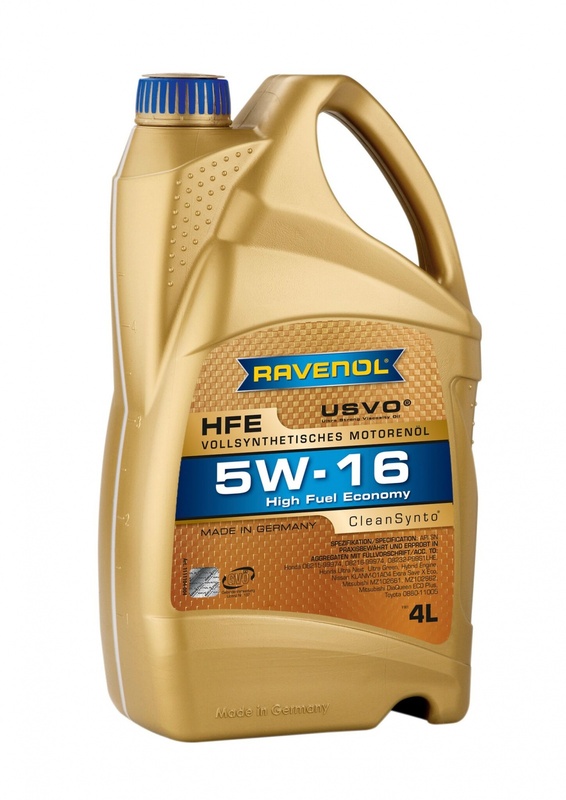 RAVENOL HFE SAE 5W-16 is suitable as a high performance, low-friction engine oil for modern petrol engines, with and without turbocharging and direct injection. It is also recommended for hybrid car engines. Fuel saving due to it's low viscosity and smooth running capabilities. Excellent wear protection and a high viscosity index ensure the long service life of the engine even at high speeds. Excellent cold start properties even at low temperatures below -30°C. No oil-related deposits in combustion chambers, in the piston ring areas and on valves.